Need to sell your house fast in Phoenix? We would like to make you a fair all-cash offer and can have a check in your hand in as little as 10 days. The best part is YOU won’t pay any commissions or closing costs. We buy houses in as-is regardless of the condition which means you won’t have to fix or repair anything before you sell it. Whether your house is full of tenants or full of stuff – we want to buy your house regardless its condition. There are many different scenarios and situations where Wesley Cash Buys Houses can help. We know that life happens! Things like job loss, needing to move quickly, divorce, behind on payments, upside down on your mortgage, struggling to avoiding foreclosure, or all the kids are gone and now it’s time to downsize. Maybe you just inherited a property and would rather have the cash on hand for other expenses, perhaps you’re a tired landlord who wants to cash out or tired of dealing with bad tenants, maybe you own a vacant house that hasn’t been lived in for years! No matter the situation, Wesley Cash Buys Houses is here to help alleviate your burden! We truly want to help and our goal is to create a win-win solution. If you have a property in Phoenix, AZ or the surrounding area and need to sell it fast, we would like to make you a fair cash offer. We can close when YOU are ready. Get rid of that burdensome property today! Simply fill out the form at the top of this page now or call 480-800-CASH for a free consultation and fair cash offer today. There are absolutely no obligations. What do you have to lose?! 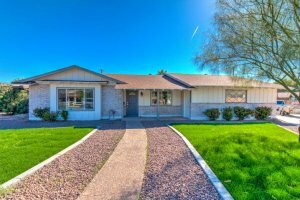 We buy houses fast in Phoenix. There are no commissions or fees and no obligation. So what are you waiting for? Need Urgent Cash and Selling your Home is the Only Option? Are you trying to sell your house but keeping running into unnecessary delays and hassles? Maybe you even considered using a real estate agent. For many people, selling their house the traditional way with a real estate agent is simply not the best solution. As you probably already know, there can be lots of headaches when trying to sell a house the agent route. Like – spending thousands to repair the property so it shows well, cleaning up and organizing constantly before showings, the struggle of finding an agent that you trust and who can actually deliver on their promise to sell your house quickly. More headaches like signing a contract that locks you in with only one agent for months while your house sits and sits. Then there are what seems to be the never ending amount of paperwork you have to sign, shuffling paperwork back and forth from your agent to their agent to their buyer back to their agent and back to your agent and……wow! Tons of paperwork! A major issue that happens all too often with trying to sell your house with a real estate agent or the for sale by owner route is often times retail buyers can tie up a home for weeks while trying to get their bank loan approved or they back out of the deal at the last second because they can’t find a buyer for the home they need to sell before they can buy yours. All this adds unnecessary stress, months to the process, and by the time it’s all said and done and you’ve paid all your agent fees, you might just break even! At Wesley Cash Buys Houses, we work differently. We provide you a fair all-cash offer on your house within 24 – 48 hours of submitting the short property info form below and can close on the date you want to close. If the house is in need of repairs and you can’t afford to or simply don’t want to fix it up… NO problem, let us deal with that for you. If you need to sell quickly, we can close in as little as 10 days because we buy houses with cash and don’t have to rely on traditional bank financing. (Go here to learn about our process). Our goal is to help make your life easier and we do that by getting you out from under that property or situation that’s causing you all that stress….while still paying a fast, fair, and honest price for your house. Want to know how to sell your house fast in Phoenix? Call Us Now at 480-800-CASH! We help property owners just like you, in all kinds of situations. From burdensome rental properties, foreclosures, divorce, death of a family member and all kinds of other situations. We buy houses in Phoenix and surrounding areas. Sometimes, the time, money and effort to sell a property are just too much for people with busy lives. If that sounds like you, just let us know about the property you’d like to get rid of and sell your house fast for cash now! If you’d like to talk to someone in our office before you submit your property information just give us a call today at 480-800-CASH! We help property owners just like you, in all kinds of situations. From divorce, foreclosure, death of a family member, burdensome rental property, and all kinds of other situations. We buy houses in Arizona… including Phoenix and surrounding areas and pay a fair cash price, fast. Sometimes, those who own property simply have lives that are too busy to take the time to do all of things that typically need to be done to prepare a house to sell on the market… if that describes you, just let us know about the property you’d like to be rid of and sell your house fast for cash. If you simply don’t want to put up with the hassle of owning that house any longer, and if you don’t want to put up with the hassle and time-consuming expense of selling your property the traditional way, let us know about the property you’d like to be rid of and sell your house fast for cash. Talk to someone in our office before submitting your property information by calling us today at 480-800-CASH.